Young guns Aaron Wright and Scott Swann will be aiming to make their mark this weekend in the KTM Junior Cup World Final at Assen in the Netherlands. Newtownabbey teenager Wright wrapped up the Santander Consumer Finance KTM British Junior Cup after winning an incredible 12 races on the Total Van Solutions KTM as he finished 103 points head of his nearest rival. The 15-year-old will be joined by fellow hopeful Swann, who finished third in the championship in his maiden year in the British championship at the age of just 13. Both will be making their debuts at the iconic Assen circuit this weekend where they will go up against a host of talented young KTM riders from around the world on the support card of the MCE British Superbike Championship. An excited Wright said: “I’m feeling confident. I really am looking forward to meeting up with the rest of the KTM riders and to race at Assen is just a dream come true. 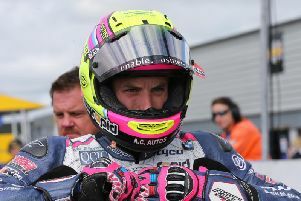 Promising young racer Swann, whose father Michael is well known in racing circles as a multiple Irish Superbike champion, showed plenty of potential this season as he rode the British circuits for the first time, displaying commendable consistency as he scored points in all 20 races. “I came home from Donington Park, the final round of the championship, and it was straight into school,” Swann said.